The Disney company's princess franchise has always been popular with young girls. It was in 2000 however that they officially became a product line in the Disney repertoire. They quickly became a huge success, accounting for over $3 billion dollars in sales in 2006. They represent a huge marketing and promotional activity for Disney. They will soon be joined by Tiana from "The Princess and the Frog" and Rapunzel. While they are not all technically princesses according to their mythologies, they are included in the line based on their appeal to young girls. Tinker Bell by contrast is not included as one of the princesses. Some other female characters appear as a sort of "guest princess" role, including Maid Marion, Alice, Nala and Megara. While they aren't technically princesses they do appear in the Sing-a-long videos. Additionally Giselle from the 2007 film "Enchanted" is considered an "honorary princess." These characters are of course very popular at the resorts. In addition the Bibbidi Bobbidi Boutique is a very popular store. It allows girls to be transformed into Princesses with various makeup, hair, manicures and accessories. You can easily recognize the girls who have been there in the parks and resorts. Unsurprisingly, the Disney Princes are not nearly as popular. While each of these princesses has a respective Prince, they do not enjoy the same popularity as their counterparts. This is probably due to the fact that while young girls routinely like to play princess, boys prefer other characters in their imaginary games. The franchise has become a huge powerhouse. They are featured in a series of sing-a-long videos as well as dolls and other toys. They are also featured in "Fantasmic!" 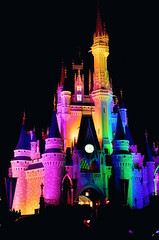 which is shown in Disneyland and Disney Hollywood Studios at Walt Disney World. Today there are over 25,000 products based on the franchise. DisMarks is your source for Disney news. For more information on Disney media and other subjects visit http://dismarks.com.